(Nanowerk News) Princeton University physical scientists will partner with researchers at four other institutions to explore the driving forces behind the evolution of cancer under a five-year, $15.2 million award from the National Cancer Institute. The Princeton Physical Sciences-Oncology Center was launched Oct. 26 as one of 12 centers in the institute's new network of Physical Sciences-Oncology Centers. Collaborating with Princeton will be: the University of California-San Francisco; the Johns Hopkins Hospital; the University of California-Santa Cruz; and the Salk Institute for Biological Studies in La Jolla, Calif. The center's goal is to understand the explosive evolution of cancer under stress at a deep theoretical and experimental level by leveraging the strengths of an interdisciplinary team of physicists, engineers, chemists, biochemists and oncologists. Using a physics-based approach, the team intends to better grasp the rules or laws that govern how cancer evolves, which may one day inform entirely new treatment approaches. "The mortality rates for many cancers are flat to rising," said Robert Austin, the center's principal investigator and a Princeton professor of physics. "It's true that people are living longer than they used to live, but in the end, the cancer wins most of the time. Our current 'shock and awe' approach to treatment may not be the best thing to do -- we're leaving behind small populations of highly resistant cells." This course may, in turn, contribute to the development of intractable cancer recurrences. Because it is nearly impossible to kill every single cancerous cell in the body, those that survive the stress of chemotherapy and radiation often have undergone mutations that render them resistant to traditional treatments, capable of rapid reproduction and therefore exceedingly dangerous. "The evolution of cancer is the Achilles' heel of cancer treatment," said Thea Tlsty, the center's co-principal investigator and professor of pathology at the University of California-San Francisco. "It's why we can't deal with metastasis or drug resistance; it's the thing that kills people. We're addressing these important questions -- how does evolution lead to metastasis and resistance, and how can we use evolution to skew the outcome in a different way?" Research in the center hinges on the use of microfabrication techniques to create complex habitats that provide an unprecedented ability to manipulate many variables at once and observe how cells respond, allowing the team to determine how different conditions promote or inhibit rapid cancer evolution and tumor formation. The results they obtain will inform the development of sophisticated computer models that simulate tumor growth and predict how and when certain tumors might invade surrounding tissue. Data obtained from these simulations will, in turn, suggest new questions to ask and explore. "One ambitious goal is the creation of an 'in silico' growing tumor, meaning a realistic model on the computer, which could suggest new experiments, test new hypotheses, predict behavior in experimentally unobservable situations, and be employed for early detection," said team member Salvatore Torquato, a professor in the Department of Chemistry, the Princeton Institute for the Science and Technology of Materials, and the Princeton Center for Theoretical Science. "As you go back and forth to refine the experiments and the theoretical models, you're coming to a real understanding of cancer. And that is what we'd ultimately like to do." 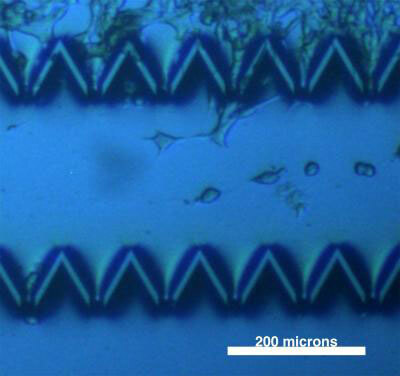 The experimental microhabitats, being developed jointly between the labs of Austin and James Sturm, a professor of electrical engineering and the director of the Princeton Institute for the Science and Technology of Materials, are constructed on chips of silicon or polydimethylsiloxane (PDMS), a silicon-based plastic. Featuring a series of wells just 10 to 100 microns in size (a human hair is roughly 100 microns in diameter), the devices allow for the growth of distinct but interconnected populations of cells. Ultrasmall channels link the compartments together, providing avenues for cells in different communities to move and interact with one another. A given chip might contain tens to hundreds of interconnected wells, each capable of housing hundreds of cells. A series of pumps and valves on the chips will enable the delivery of a variety of mechanical and chemical stressors, such as extreme pressure or chemotherapeutic agents, to different populations of cells living under a range of different conditions, including gradients of temperature and resource availability. "A tumor is a heterogeneous thing with many different metapopulations of cells inside it," Austin said. "We're trying to represent the biological environment of a tumor and hopefully understand the rules by which a tumor evolves." Experiments will be conducted at Princeton using both bacterial cells, which form biofilms analogous to human tissue that can be used as model systems, and human cancer cell lines. The research team currently is developing technologies to make the microscopes fully controllable remotely, allowing team members at partner institutions to conduct experiments and obtain real-time data via the Web. The Princeton Physical Sciences-Oncology Center's research will build on previous experiments by Austin and his collaborators using a silicon microhabitat to study the evolution of E. coli bacteria. The research team already is culturing prostate cancer cells on silicon and PDMS chips, using pumps and valves to refresh the growth medium. To create the most realistic representations of human tissue, the microhabitats in development will be far more complex than the currently existing chips. One key challenge to address will be optimizing the use of biological matrices on the chips to make them extremely favorable for the growth of mammalian cells, triggering rapid evolution in a relatively short period of time. This process also may require the development of novel three-dimensional fabrication techniques. Additional members of the research team include David Botstein, the director of Princeton's Lewis-Sigler Institute for Integrative Genomics, who will lead the center's outreach and education efforts; David Haussler, a professor of biomolecular engineering and the director of the Center for Biomolecular Science and Engineering, and Nader Pourmand, an assistant professor of biomolecular engineering, both of the University of California-Santa Cruz; Robert Getzenberg, the director of research of the James Buchanan Brady Urological Institute at the Johns Hopkins Hospital; and Beverly Emerson, a professor in the Regulatory Biology Laboratory at the Salk Institute for Biological Studies. The other centers in the National Cancer Institute's new network will be based at Arizona State University, Cornell University, the H. Lee Moffitt Cancer Center & Research Institute, Johns Hopkins University, the Massachusetts Institute of Technology, Memorial Sloan-Kettering Cancer Center, Northwestern University, the Scripps Research Institute, the University of California-Berkeley, the University of Southern California and the University of Texas Health Science Center at Houston. "By bringing a fresh set of eyes to the study of cancer, these new centers have great potential to advance, and sometimes challenge, accepted theories about cancer and its supportive microenvironment," said National Cancer Institute Director John Niederhuber. "Physical scientists think in terms of time, space, pressure, heat and evolution in ways that we hope will lead to new understandings of the multitude of forces that govern cancer -- and with that understanding, we hope to develop new and innovative methods of arresting tumor growth and metastasis."